Not only is Volley & Bayonet well served by this website and its large array of scenarios and resources, but also by several published supplements. The following is a listing of Volley & Bayonet resources in traditional printed format. They are divided into two groups, where the most recent which contain scenario books fully compliant with the second edition rules. The second grouping contain scenarios written for the first edition of the rules. These scenario books remain very usable with some modification to the scenarios to account for some minor changes. The second edition of the Volley and Bayonet rules was published in 2008. 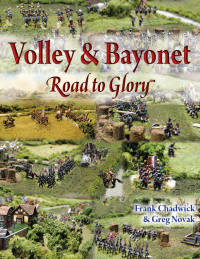 “Volley & Bayonet: Road To Glory” includes rules for the Black Powder Era from 1700 to 1890. In addition, it includes complete army lists for the Napoleonic Wars and eight major historic battles as game scenarios. They are: Trebbia (1799); Marengo (1800); Austerlitz (1805); Auerstaedt; (1806); Eylau (1807); Talavera (1809); Dennewitz (1813); Quatre Bras (1815). Additional army lists and scenario books are planned. 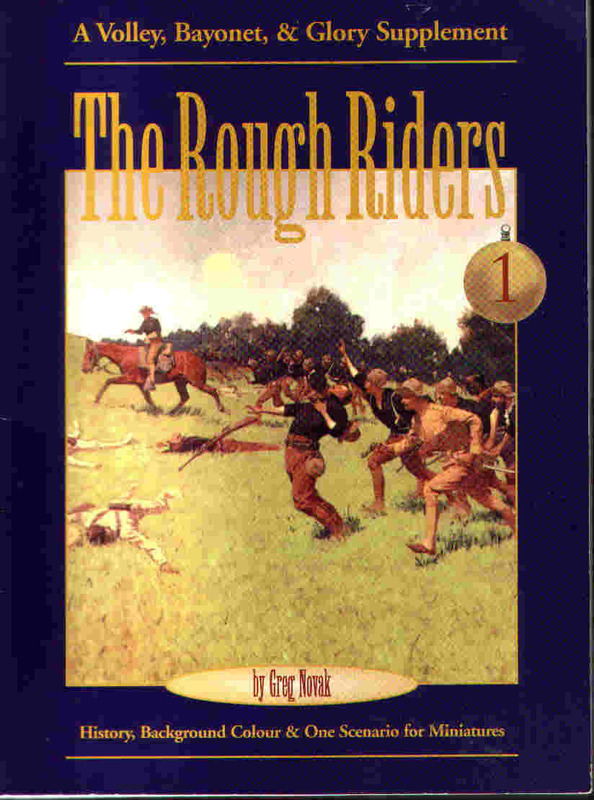 The book provides scenarios for refighting nine battles and is the first of two volumes. The 62 pages are generally divided equally between the battles. Each battle has an introduction, a brief historical outline and a section providing detail on refighting the battle with Volley & Bayonet. Then a map is provided along with full rosters for the games. Maps and photographs are black and white throughout. This keeps the production costs down yet provides an attractive volume.The battles covered in this first volume are: Lobositz (1756); Prague (1757); Kolin (1757); Rossbach (1757); Leuthen (1757); Hochkirch (1758); Liegnitz (1768); Torgau (1760) and Freiburg (1762). 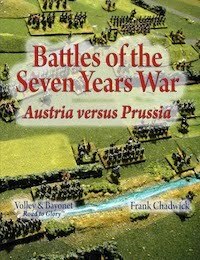 This scenario book, comprising some 77 pages, covers battles on Prussia’s strategic flanks, between Prussia and her allies by the armies of France (six battles) and Russia (three battles). The six battles between the Army of Observation and the French are: Hastenbeck – (1757); Krefeld (1758); Bergen (1759); Minden (1759); Warburg (1760); Kloster Kamp (1760). The three battles between the Prussians and Russians are: Gross Jaegersdorf (1757); Zorndorf (1758); Kunersdorf (1759). 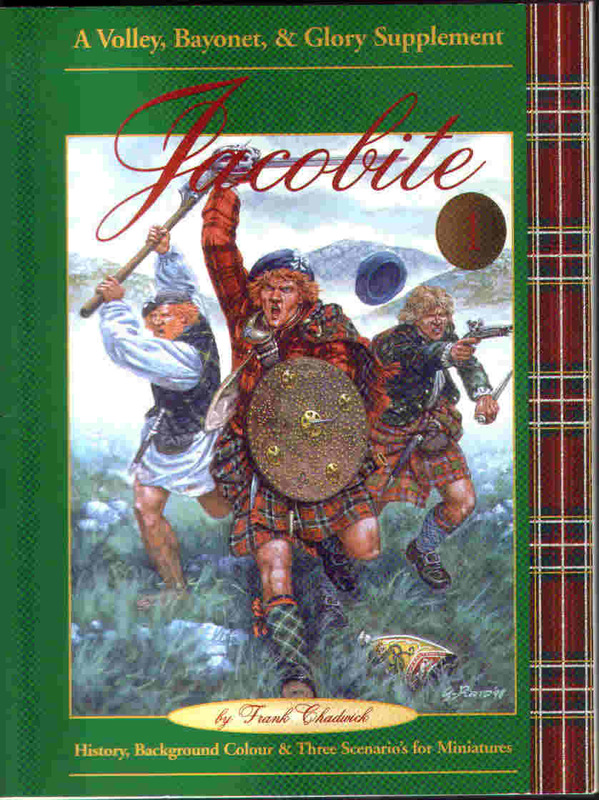 The original Volley & Bayonet rules which were first published by GDW back in 1994. This first edition is now out of print, replaced bythe second edition. The rule book includes nine historical scenarios as well as period specific rules. The scenarios include: Lobositz; Minden; Brandywine; Marengo; Austerlitz; Salamanca; Alma; First Manassas & St. Privat. 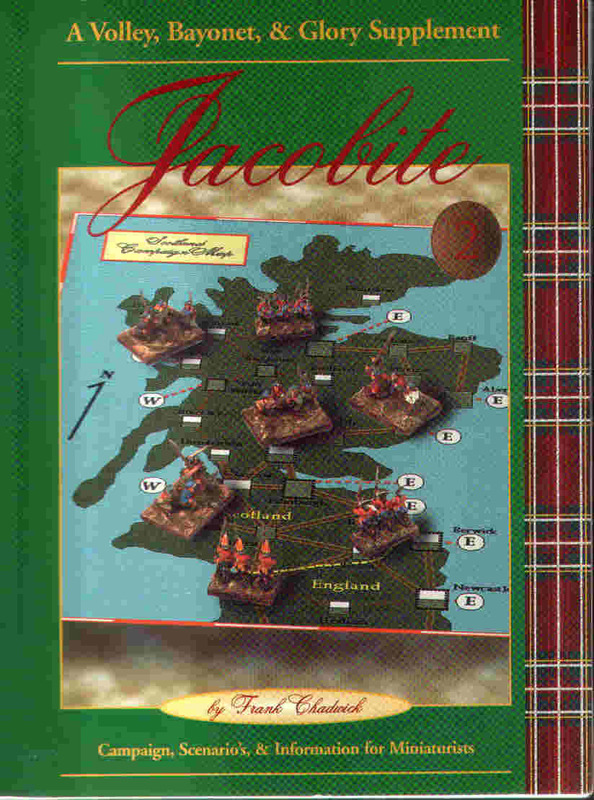 This was the first scenario book for Volley & Bayonet and was published by GDW in 1995. It remains an excellent work and highly sought after by players intending to use Volley and Bayonet for American Civil War gaming. In addition to some period specific rules the supplement’s main claim to fame is it’s ten historical scenarios. These five five eastern scenarios being: Second Manassas (1862); Antietam (1862); Brandy Station (1863); Gettysburg (1863) and Third Winchester (1864). The remaining five scenarios are from the western theatre and are: Shiloh (1862) ; Stones River (1862); Champion Hill (1863); Chickamauga (1863) and Franklin (1864). Finally the campaign rules included allow the entire Civil War to be refought using Volley and Bayonet to resolve tabletop battles. 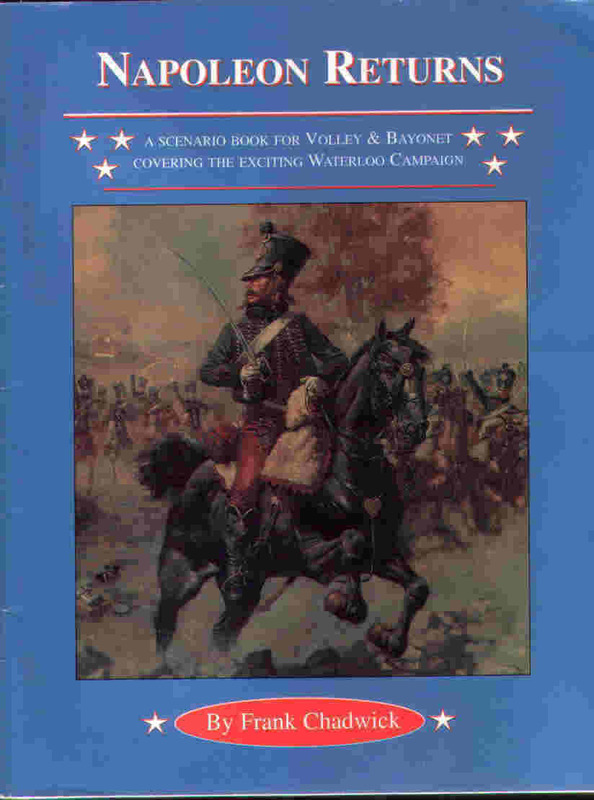 The Waterloo Campaign captures the interest of most wargamers and with Volley and Bayonet being originally designed for refighting the battles of 1815 it’s not surprising this excellent scenario book is found on many wargamers shelves. Starting with the “Campaign as History” Frank Chadwick moves through gaming the Waterloo Campaign including details of the battles and armies with full orders of battle for the armies involved. As well as a small campaign game scenarios are provided for the battles of Quatre Bras; Ligny; Waterloo & Wavre. The third supplement for V&B published “Austria Stands Alone” deals with the battles of the 1809 Campaign in Northern Italy and around Vienna. Chapter One covers the history of the campaign while subsequent chapters cover the battles, armies. The scenarios covered include: Sacile; Piave; Raab; Aspern-Essling and finally Wagram. The first three are excellent medium scale scenarios for those with limited troop numbers. This first volume details the history and background colour of the ’45. Included is a section on gaming the ’45 using Volley & Bayonet as well as the Government and Jacobite armies in an historical context. 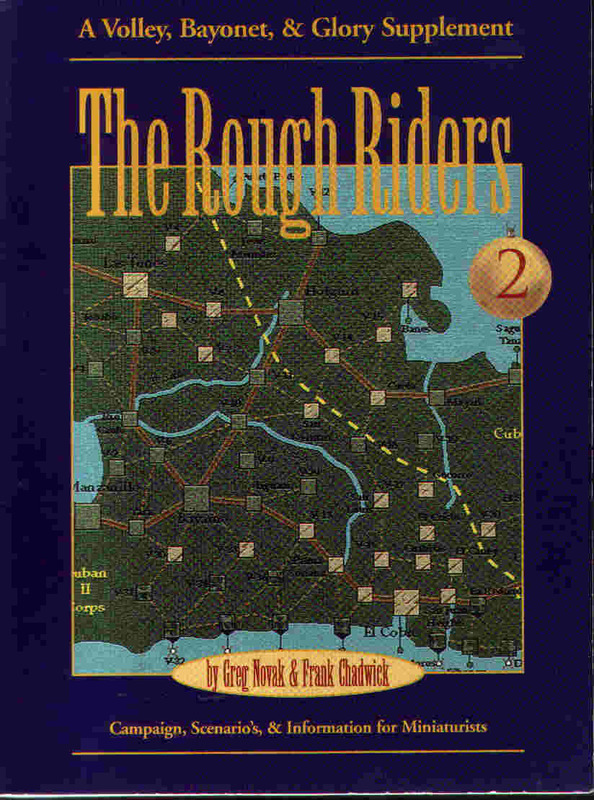 There are then three historical scenarios including maps and orders of battle. First up is Prestonpans, followed by Falkirk and finally Culloden. Because of the size of these battles these scenarios are provided at a reduced figure scale. 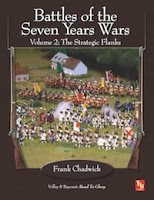 The second volume continues the the revolt with no less than eight Volley & Bayonet scenarios. Starting with the small historical battles at Clifton and Inverurie and followed by six hypothetical battles including: Corieyairack Pass; Hexham; Stone; Finchley Common; Second Battle of Killiecrankie Pass & Fochabers. Finally the campaign rules for the ’45 are defined as well as two campaign maps allowing the entire rebellion to be refought. Because of the size of these battles these scenarios are provided at a reduced figure scale. Nominally outside the period covered by the Volley & Bayonet rules the Spanish-American War of 1898 recieves a good treatment by this two volume set. The first volume details the background to the war through to it’s historical conclusion. It focuses mainly on the Cuban Campaign, and to a lesser extent the Puerto Rican Campaign. As well as a detailed look at both the Spanish and American armies the first book concludes with an historic scenario of San Juan Heights. Because of the size of these battles these scenarios are provided at a reduced figure scale. The second volume begins with detail on gaming the Spanish-American War using Volley & Bayonet and then moves on to the uniforms of the armies. This followed by scenarios for Las Guasimas and El Caney. The scenario book concludes with the complete campaign rules for the Santiago Campaign. Because of the size of these battles these scenarios are provided at a reduced figure scale. 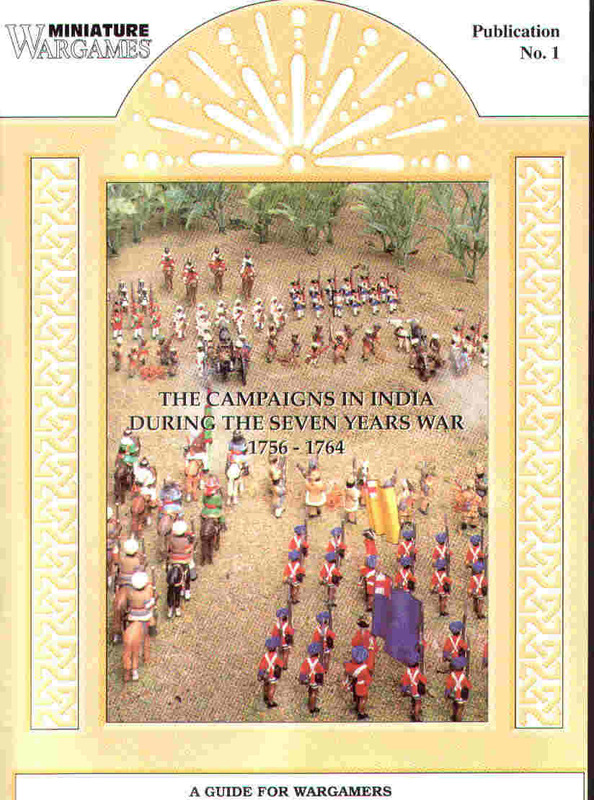 This wargamers guide by Mike Kirby is published by Miniature Wargames and is designed as a general guide for the wargamer interested in the Campaigns in India. It starts with the historical background before moving on to some nine historical scenarios with details and rules on using Volley & Bayonet to refight the battles. The scenarios covered are: Plassey; Condore; Wandiwash; Patna; Panipat; Pondicherry; Katwa; Sooty and Buxar. Mike concludes with details on painting basing and forming armies along with several specific Volley & Bayonet rules for warfare on the sub-continent.